The full title of this course is, S.A.B.E.R. — Strategic Anti-Blade Engagement Response Method. The SABER Method is the edged weapons portion of the RAVEN Method Close Quarter Defensive Tactics System The goal of this course is to train and certify candidates in edged weapon defense tactics. Participants will learn to the necessary skills to survive a violent edged weapon assault. Presented in the course are the physical and conceptual skills required for realistic edge weapon defense. Complete instruction in Module One includes footwork, methods and angles of attacks, and firearms deployment. Module Two of the course delves into the use of the tactical duty knife as a weapon of last resort for lethal force situations. Target immobilizations, weapon retention and ground deployment are just some of the topics covered in the module. The material is based in gross motor skills, which can be relied upon under high stress conflict. These two programs came about after S.A.B.E.R. Staff identified a large void that needed to be filled in DT training. Edged weapon defense is often ignored or when addressed it is often dangerously lacking. Some programs are based on antiquated methods taken from martial arts, others appear on the surface to be adequate programs but upon deeper evaluation they come up short. Some other programs offer viable material but require inordinate amounts of time to become and maintain proficiency. Most importantly, few programs truly address the limitations or special considerations required of training Law enforcement Officers. The program has been pressure tested in heavy scenario training and gone through several revisions based on the material’s effectiveness under stressful, live scenario testing. 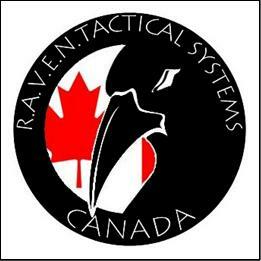 The Raven Method Tactical Baton program is a multi-level program which trains individuals on a variety of impact weapons. The program teaches the Mini-baton, the Telescopic Baton, Riot Baton, Side Handle baton and more. The training will specifically address the use of the Telescopic Baton for Peacekeeping personnel. 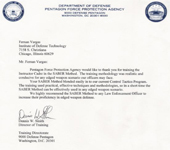 While the material here is easily adapted to civilian or battlefield use, it is primarily designed with the law enforcement community in mind and the use of force concerns often presented to police personnel. The program is designed to be completed in a short period of time. The Program is meant to impart the student with what is referred to as “SURVIVAL ESSENTIALS”. That is a minimum effective proficiency for self protection. This is not to say that the program is lacking in fact the program can be as functional and “Advanced” as the student wished it to be. Remember that “Advanced Material is the basics done well”. This program draws from numerous sources, including a variety of Police Baton methods, military baton methods, and select tactics from Stick Fighting Martial Arts or “Martial Baton Methods”. The D.A.R.T. (Defense And Retention Tactics) Hand Gun course was designed to train and qualify law enforcement and security officers on how to properly retain their duty pistol. In 2008 4 officers were killed in the line of duty in the United States with their own service weapon. We at Raven Tactical International feel that 4 officer deaths are 4 to many. In an effort to help increase officer survival and safety, Raven Tactical International now presents its official Basic Pistol Retention and Disarming course to the Law Enforcement Community. The program is based on simple and effective techniques which are easy to learn, use and retain.